The Vaughan Williams classification was introduced in 1970. As a doctoral candidate at Oxford University working in the lab of Miles Vaughan Williams, Dr. Bramah Singh determined that amiodarone and sotalol had antiarrhythmic properties and belonged to a new class of antiarrhythmic agents (what would become the class III antiarrhythmic agents). With regards to management of atrial fibrillation, classes I and III are used in rhythm control as medical cardioversion agents, while classes II and IV are used as rate-control agents. Class II agents are antisympathetic nervous system agents. Most agents in this class are beta blockers. Class III agents predominantly block the potassium channels, thereby prolonging repolarization. Since these agents do not affect the sodium channel, conduction velocity is not decreased. 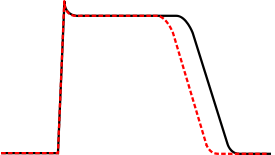 The prolongation of the action potential duration and refractory period, combined with the maintenance of normal conduction velocity, prevent re-entrant arrhythmias. (The re-entrant rhythm is less likely to interact with tissue that has become refractory). The class III agents exhibit reverse-use dependence (their potency increases with slower heart rates, and therefore improves maintenance of sinus rhythm). Drugs include: bretylium, amiodarone, ibutilide, sotalol, dofetilide, and dronedarone. Inhibiting potassium channels, slowing repolarization, results in slowed atrial-ventricular myocyte repolarization. Class III agents have the potential to prolong the QT interval of the EKG, and may be proarrhythmic (more associated with development of polymorphic VT). Since the development of the original Vaughan-Williams classification system, additional agents have been used that do not fit cleanly into categories I through IV. It presents the drugs on two axes, instead of one, and is presented in tabular form. On the Y axis, each drug is listed, in roughly the Vaughan Williams order. On the X axis, the channels, receptors, pumps, and clinical effects are listed for each drug, with the results listed in a grid. It is, therefore, not a true classification in that it does not aggregate drugs into categories. ↑ Kloner RA (2009). "A Salute to Our Founding Editor-in-Chief Bramah N. Singh, MD, DPhil, DSc, FRCP". Journal of cardiovascular pharmacology and therapeutics. 14 (3): 154–156. doi:10.1177/1074248409343182. ↑ Kulmatycki KM, Abouchehade K, Sattari S, Jamali F (May 2001). "Drug-disease interactions: reduced beta-adrenergic and potassium channel antagonist activities of sotalol in the presence of acute and chronic inflammatory conditions in the rat". Br. J. Pharmacol. 133 (2): 286–94. doi:10.1038/sj.bjp.0704067. PMC 1572777 . PMID 11350865. ↑ "protocol for management of haemodynamically stable ventricular tachycardia - General Practice Notebook". www.gpnotebook.co.uk. Retrieved 2016-02-09. ↑ Milne JR, Hellestrand KJ, Bexton RS, Burnett PJ, Debbas NM, Camm AJ (February 1984). "Class 1 antiarrhythmic drugs—characteristic electrocardiographic differences when assessed by atrial and ventricular pacing". Eur. Heart J. 5 (2): 99–107. PMID 6723689. ↑ Trevor, Anthony J.; Katzung, Bertram G. (2003). Pharmacology. New York: Lange Medical Books/McGraw-Hill, Medical Publishing Division. p. 43. ISBN 0-07-139930-5. ↑ Lenz, TL; Hilleman, DE (2000). "Dofetilide, a New Class III Antiarrhythmic Agent". Pharmacotherapy. 20 (7): 776–786. doi:10.1592/phco.20.9.776.35208. PMID 10907968. ↑ Conti JB, Belardinelli L, Utterback DB, Curtis AB (March 1995). "Endogenous adenosine is an antiarrhythmic agent". Circulation. 91 (6): 1761–7. doi:10.1161/01.cir.91.6.1761. PMID 7882485. ↑ Brugada P (July 2000). "Magnesium: an antiarrhythmic drug, but only against very specific arrhythmias". Eur. Heart J. 21 (14): 1116. doi:10.1053/euhj.2000.2142. PMID 10924290. ↑ Hoshino K, Ogawa K, Hishitani T, Isobe T, Eto Y (October 2004). "Optimal administration dosage of magnesium sulfate for torsades de pointes in children with long QT syndrome". J Am Coll Nutr. 23 (5): 497S–500S. doi:10.1080/07315724.2004.10719388. PMID 15466950. ↑ Hoshino K, Ogawa K, Hishitani T, Isobe T, Etoh Y (April 2006). "Successful uses of magnesium sulfate for torsades de pointes in children with long QT syndrome". Pediatr Int. 48 (2): 112–7. doi:10.1111/j.1442-200X.2006.02177.x. PMID 16635167. ↑ Lindberg JS, Zobitz MM, Poindexter JR, Pak CY (1990). "Magnesium bioavailability from magnesium citrate and magnesium oxide". Journal of the American College of Nutrition. 9 (1): 48–55. doi:10.1080/07315724.1990.10720349. PMID 2407766. ↑ "The 'Sicilian Gambit'. A new approach to the classification of antiarrhythmic drugs based on their actions on arrhythmogenic mechanisms. The Task Force of the Working Group on Arrhythmias of the European Society of Cardiology". Eur. Heart J. 12 (10): 1112–31. October 1991. PMID 1723682. ↑ Vaughan Williams EM (November 1992). "Classifying antiarrhythmic actions: by facts or speculation". J Clin Pharmacol. 32 (11): 964–77. doi:10.1002/j.1552-4604.1992.tb03797.x. PMID 1474169. ↑ "Milestones in the Evolution of the Study of Arrhythmias". Retrieved 2008-07-31. ↑ Fogoros, Richard N. (1997). 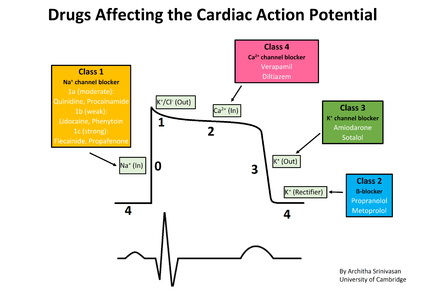 Antiarrhythmic drugs: a practical guide. Oxford: Blackwell Science. p. 49. ISBN 0-86542-532-9.